Are Customers Loyal to Your Brand or Just Your Loyalty Program? As a marketer, you may find yourself wondering if your customers are actually loyal to your brand, or just to your loyalty program. You may also wonder if your customers are emotionally invested in your brand or if they only purchase from you out of habit and because of the discounts they are given through your loyalty marketing efforts. Does a loyalty program REALLY provide a feeling of loyalty between a brand and their customers? According to Bond Brand Loyalty, 29% of customers agree that they wouldn't be loyal to a brand if it weren't for their loyalty program. Bond's Love Matrix (as shown in the photo) displays the love of a brand vs. the love of a program. "Members who state high brand love also tend to state feeling delighted, feeling special, feeling recognized, feeling inspired by, and confident with, their brand experiences." (Bond Brand Loyalty). As you can see, there are four options in this matrix. High Brand Love/High Program Love: If a company has high brand love along with high program love, it means that their program is in sync with their brand and they are doing it right. A great example of this is Starbucks. Starbucks Rewards offers free drink or food rewards with custom offers, early access to new products, and easy payment with their mobile app. They create customer loyalty to their brand through a great loyalty program that is aligned with their brand, along with an impressive customer experience. High Brand Love/Low Program Love: Brands with low program love and high brand love should make sure that loyalty program members are receiving the brand's promises, perceptions, and truths. A good example is Kroger. Their program needs the brand's support to succeed. Low Brand Love/High Program Love: If a brand has a high love for the loyalty program but a low interest in loyalty of the actual brand, then the loyalty program should be used to build brand loyalty. One company with this issue is Best Buy. They give great discounts on their products through their rewards program, but their brand loyalty is seriously lacking and needs to use the loyalty program to build their brand loyalty. 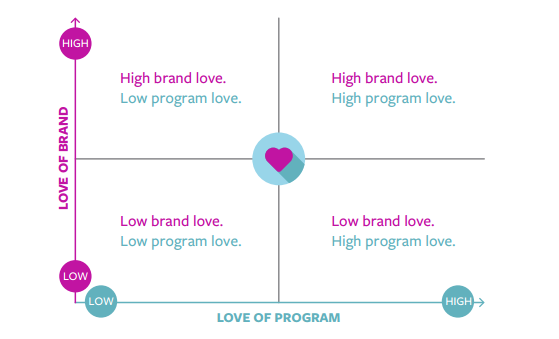 Low Brand Love/Low Program Love: If a brand has low program love and low brand love, they need to focus on both brand alignment and customer experience. Take a look at OfficeDepot. In their case, they should re-tool their program to fix what is broken about their brand. "Programs that align with the attributes of the brand deliver 3x higher customer satisfaction, 6x higher likelihood to recommend, and 8x higher chance to purchase again." (Bond Brand Loyalty). So, how do you increase brand loyalty? The secret to a high brand loyalty is great customer experience. Creating loyalty to your program isn't enough - you need brand loyalty. Without it, you leave your customers open to go to your competitors. Competitors will have a hard time copying your brand-aligned program. Provide excellent customer experience for loyalty members. How does your loyalty program align with your brand? Download our Ten Tips for Rewards Program Success whitepaper and start creating loyal customers today.